In recent months a bright spotlight has been shone upon multi-instrumentalist Billy Sherwood. The 51 year old, Las Vegas-born musician has had a long and prolific career of his own, releasing his original music and producing an array of other artists, primarily in progressive rock. But his long and fruitful association with some of the giants in prog has led him into two pivotal bass roles. He replaced the late Chris Squire in Yes beginning 7 August 2015 (Squire died in June of that year) and took over for John Wetton (who passed away 31 January) for Asia’s 2017 concert tour. So he didn’t. Sherwood can quickly rattle off the details of his own live setup, in part because he has endorsement deals with all of the relevant manufacturers. “Spector basses, Line 6 pedal boards to create all the effects, Tech 21 amplifiers, and Rotosound strings.” He has a special affinity for one custom-made instrument. “Spector designed a couple of really unique basses for me,” he says. “One is a one-of-a-kind 8-string, and another is the ‘Fish’ bass. It has fish running up and down the scales, in honor of Chris.” He uses that setup for his live dates with Yes and Asia. Beyond his bass playing with high-profile touring bands, Sherwood remains quite busy. He’s had a long relationship with Cleopatra Records and its associated labels, producing tribute albums (honoring Supertramp, Pink Floyd and others) and organizing all-star collective projects (The Prog Collective, The Fusion Syndicate). Sherwood has known Cleopatra’s founder Brian Perera for many years. “He was and remains an ally in this business,” Sherwood says. 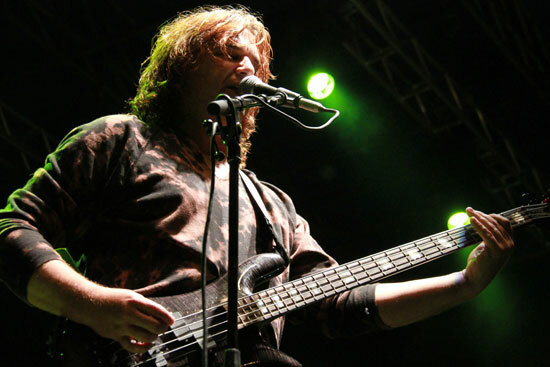 “We’ve made a lot of records together, and the people at Cleopatra trust that I’m going to keep the quality high, maintain the highest musical integrity, and get the best people involved.” Fittingly enough – and bringing together all of his projects into one – Billy Sherwood’s current project for the label is a tribute to Chris Squire. An edited version of this feature appeared in Bass Guitar (UK).